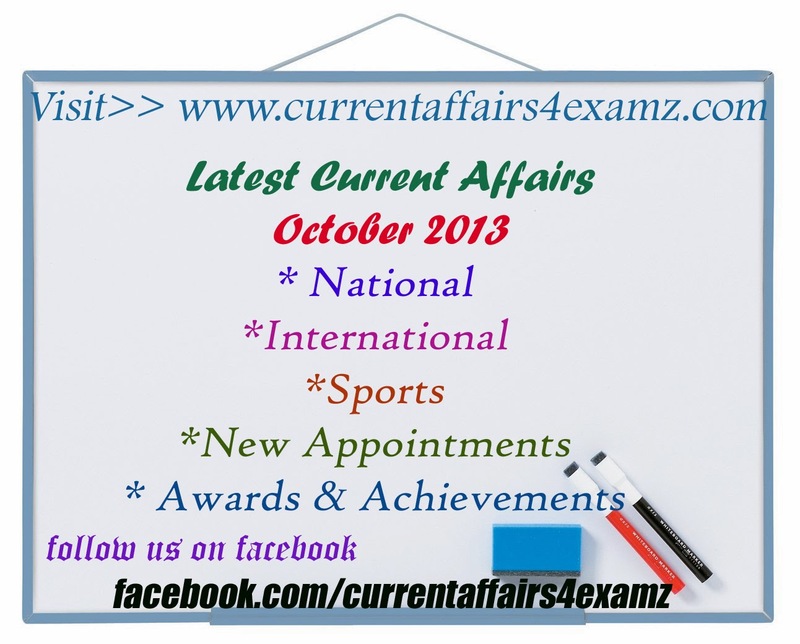 October 2013 Current Affairs Questions and Answers for preparing Exams| IBPS PO/Clerk Exam| SSC | UPSC | Civil Services | Bank | LD Clerk and all other Competitive Examinations. Latest Current Affairs from First Week of October 2013 in PDF- useful for all competitive Examinations!!!!! Q1. Which team won the Champions League Twenty-20 title 2013? Note: They defeated Rajasthan Royals by 33 runs in the finals held in New Delhi on 6 October 2013. Q2. Sania Mirza won the China Open tennis championship trophy (women’s Doubles) with Cara Black on 5 October 2013 in Beijing. Cara Black is from which nation? Q3. 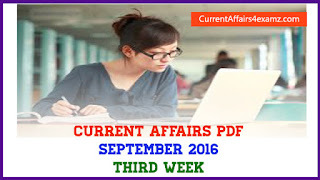 Election Commission on 4 October 2013 announced the dates of holding the General Elections to the Legislative Assemblies of 05 States whose terms expire around the same time together. Name these 05 states? Q4. Who took over charge as chairman and managing director (CMD) of Bharat Petroleum Corporation Limited (BPCL) on 1 October 2013? Note: He has succeeded R.K. Singh. Q5. Name the new state which was approved by Union Cabinet on 3 October 2013 to be formed bifurcating the existing State of Andhra Pradesh? Note: City of Hyderabad will function as the common capital for both the States (Telangana and Seemandhra) for a period of ten years. Q6. Union Cabinet on 2 October 2013 decided to withdraw the ordinance on convicted lawmakers, as well as the Bill that sought to amend the Representation of the People Act. What was the aim of the ordinance? Ans. It will allow the convicted MPs or MLAs to continue in office if their appeal is admitted by a higher court within 90 days of conviction by the trial court. However, they will not be allowed to vote or draw salaries till the case is decided. Q7. Name the Former Foreign Secretary of India who was on 30 September 2013 appointed as India's High Commissioner to the United Kingdom? Ans. Future we want: what older persons are saying. Q9. Which country won 3rd Under-21 Sultan of Johor Cup hockey tournament held in Johor Bahru on 29 September 2013 defaeting Malaysia 3-0? Q10. Who was on 29 September 2013 re-elected as the President of the Board of Control for Cricket in India (BCCI) for a third term at its 84th annual general meeting (AGM) held at Chennai? Q11. Who was on 29 September 2013 appointed as chairman of the IPL during the Annual General Meeting of the Board of Control for Cricket in India (BCCI) at Chennai? Q12. Supreme Court of India proposed a three-member panel on 7 October 2013 to examine the IPL spot-fixing scandal. Who is the head of the panel? Note: Other members of the panel are senior advocate and Additional Solicitor General N Nagehswar Rao and Assam Cricket Association member Nilay Dutta. Q13. India on 7 October 2013 successfully test-fired it’s indigenously developed nuclear-capable ................... missile with a strike range of 350 km from Chandipur Integrated test range in Odisha? Note: The surface-to-surface missile was test fired from a mobile launcher. The last user trial of Prithvi-II was successfully carried out from the same base on 12 August 2013. Q14. World Habitat day is observed across the world on 7 October 2013. The purpose of this day is creation of the global awareness regarding the State of the towns and cities and the basic human right to adequate shelter. Which day of October is generally observed as World Habitat day? Ans. First Monday of October every year is designated as the World Habitat Day by the United Nation. Note: Theme of the World Habitat Day 2013 is Urban Mobility to encourage people to shift towards more sustainable modes of transportation. In the year 2012, the theme was Changing Cities, Building Opportunities. Q15. Novak Djokovic clinched his fourth China Open title in five years on 6 October 2013. Whom did he defeat in the final? Note: By a margin of 6-3 6-4. Q17. Which country won Under-19 Asian Rugby Championship 2013 by defeating India in the finals held in Lahore on 5 October 2013? Q18. India and Bangladesh on 5 October 2013 jointly inaugurated the India-Bangladesh Grid Inter-connection at which place in Bangladesh? Q19. Name the Indian women who won bronze medal at the Judo tournament held in Tashkent, Uzbekistan on 5 October 2013? Note: It was India’s first IJF Grand Prix medal. Competing in 52kg weight category, Kalpana defeated Zarifa Sultonova of Uzbekistan but lost to Gili Cohen of Israel. Q20. Union government of India on 5 October 2013 launched the Inter Company ........... portability scheme in 24 cities across the country? Note: Under the portability scheme, a consumer can now opt for the distributor of his choice within a cluster of LPG distributors in the vicinity and across the oil companies. Q21. Name the ship acquired by Geological Survey of India (GSI) on 4 October 2013 for around 600 crore Rupees for the purpose of undertaking deep-sea surveys as well as exploration of the minerals lying in the depths of oceans? Q22. Who was selected as the first Miss Universe contestant to represent Myanmar in more than 50 years time in history of the country on 3 October 2013? Q24. Union Health and Family Welfare Minister on 4 October 2013 launched the indigenously produced Japanese Encephalitis (JE) vaccine JENVAC in New Delhi. Name the present Union Health and Family Welfare Minister? Q25. Which country on 4 October 2013 qualified for its maiden ICC World Cup after defeating Kenya by seven wickets at World Cricket League Championship in Sharjah? Q26. Which companies were awarded the cricket sponsorship rights for all international series and the domestic tournaments in India for the year 2013-14 by BCCI at the base price of two crore rupees per fixture? Q27. Cabinet Committee on Economic Affairs (CCEA) on 3 October 2013 cleared Jet Airways proposed sale of 24 per cent equity to Abu Dhabi-based ........ Airways? Note: It will pave way for the biggest ever foreign investment in the Indian aviation sector. Q28. Indian Railways on 3 October 2013 signed a pact with Rashtriya Ispat Nigam Limited (RINL) to set up the country's biggest Forged Wheel plant at Lalganj, Raebarelli in which state? Q29. The International Day of Non-Violence was observed on 2 October across the world on the occasion of birth anniversary of Mahatma Gandhi. In which year United Nations General Assembly established 2 October as the International Day of Non-Violence? Q30. President of India, Pranab Mukherjee presented the First National Award for Senior Citizens - Vayoshreshtha Samman, 2013 on the occasion of International Day of Older Persons at a function in New Delhi. Which day of october is observed as International Day of Older Persons? Q31. Which team won the NKP Salve Challenger Cricket Trophy by defeating Delhi by 50 runs in the final at the Holkar Cricket Stadium, Indore on 29 September 2013? Q32. Which country on 2 October 2013 announced that it is pulling out of the Commonwealth with immediate effect? Note: Gambian, a West African country joined the Commonwealth of Nations in 1965. Commonwealth of Nations is a voluntary association of 54 countries, many of them former territories of the British Empire. It was established in 1949. Q33. National Voluntary Blood Donation Day was observed on......th October every year in India? Note: It is organised by National Blood Transfusion Council (NBTC) and National AIDS Control Organisation, Ministry of Health and Family Welfare of Government of India. It is observed to increase awareness among the people and the importance of voluntary blood donation. Q34. Which Indian was presented with Friendship award by China-the highest honor given to foreigners on 29 September 2013? Q35. Sania Mirza of India and ................. of Zimbabwe won the Toray Pan Pacific Open tennis championship women's doubles title by defeating Hao-Ching Chan (Chinese Taipei) and Liezel Huber (USA) 4-6, 6-0, 11-9 in final at Tokyo on 28 September 2013? Q36. Vice President of India, M. Hamid Ansari released a commemorative postage stamp in the memory of Baba Jumdev at a function in Gondia, Maharashtra on 30 September 2013. Who was Baba Jumdev? Ans. Baba Jumdev was a prominent spiritual leader and revered social activist. He was a spiritual guide and a social reformer for who worked towards the service of humanity. Q37. Olympian Swaran Singh Virk led Indian rowers to win the Gold medal at 15th Asian Senior Rowing Championship on 29 September 2013. Where was the vent held? Q38. Every year on ..........th September celebrated as the World Heart Day since 1999? Q39. Who became the campaign committee chief of Bharatiya Janata Party for the 2014 Lok Sabha polls on 29 September 2013? Q40. India’s lawn tennis player Rohan Bopanna with French partner Edouard Roger-Vasselin won the Rakuten Japan Open tennis championship (Men's Doubles) on 6 October 2013. Where was the event held? Q41. India's foreign exchange (forex) reserves fell by.............. billion US dollars to 276.26 billion US dollars for the week ended on 27 September 2013 as compared to 277.38 billion US dollars in the previous week due to a sharp drop in the value of foreign currency assets, official data showed? Q42. Ninth Formation Day of National Disaster Management Authority (NDMA) took place in New Delhi at Vigyan Bhawan, New Delhi on 4 October 2013. What is the function of National Disaster Management Authority (NDMA)? Ans. NDMA is India’s apex body in the area of disaster management. Q44. Indian Railways on 4 October 2013 adopted first ever unique modern technology for maintenance of its passenger coaches, wagons and locomotives. Name the new technology? Ans. Acoustic Bearing Detectors (ABD) & Wheel Impact Load Detectors (WILD). Q45. Who won Himalaya Bicycle Rally which concluded in Shimla on 3 October 2013? Q46. Name the writer known for thrillers, especially The Hunt for Red October and Patriot Games, who died in Baltimore, US on 1 October 2013? Q47. Who won singles title at WTA Pan Pacific Open on 28 September 2013 at Tokyo? Q48. Name the Swiss-Born Philanthropist and Muslim Spiritual Leader who visited India from 17 to 29 September 2013? Q49. Name the Indian who won silver in the AIBA World Youth Boxing Championship held in Albena, Bulgaria on 28 September 2013?